You will need information from your child’s report card in order to complete this process and the information entered must match EXACTLY. On the left side of the page, select "First Time Here? Click here to create a new account." Type Hampton Bays in the School District box. Choose an authentication question (name of pet, etc., used if you forget your password to verify your identity). Enter parent legal name (no nicknames, no abbreviations, including middle initial), address, and telephone number. Enter student name (as it appears on the report card), select school, grade. You will receive an e-mail that your request has been received and is awaiting approval. This process may take up to 7 business days. You will receive an approval e-mail once your information has been verified. 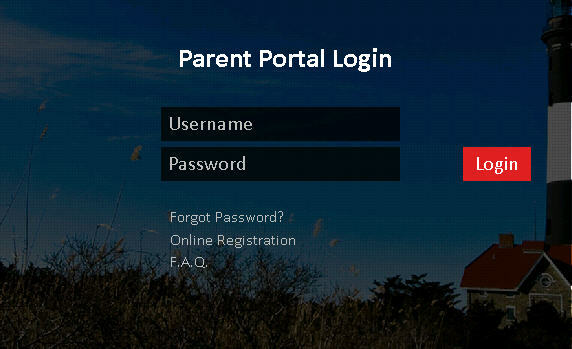 Please note: The easiest way to view these directions while using the new portal is to open a second browser window, either by opening another tab, or clicking File>New Window. Once you've entered the portal by typing your username and password, read through the user agreement, then click the "I Agree" button. On the opening page, you will see the name(s) of your child(ren). Double click on the name to see the profile, schedule, report card and attendance information. The only dates reported are those on which the student was absent or late to one or more classes. The numbers across the top represent the class periods. Only look at periods one - nine and the last column marked "Daily." Explanations for the letter codes used are explained on the bottom of the grid. For further info, you can click on the button at the top of each page. When you are done, please click the log out button at the top of the page.